While the US president is taking further steps to build America's Wall, Canada's Justin Trudeau seems to have a totally opposite approach to migration policy, as his country is leaving its door ajar for thousands of illegal border crossers from all over the world, with Canadian border officers even helping the migrants carry their luggage. My GPS tells me that I have arrived, but the road between the trees and Quebec's snowy fields continues for at least two more kilometres before we pull over at a dead-end. We'll be staking out the border together with Faith Goldy – a Canadian right-wing journalist, who previously worked as a commentator and reporter for several media outlets. Her coverage of the illegal migrant influx into Canada and strong position on the government's policies over the issue have landed her in hot water with mainstream media outlets branding her a "white nationalist," an accusation Goldy herself has strongly denied. While we're waiting, Faith dials "City Taxi" — a company in the American town nearby, to show me how easy it is to arrange a one-way trip for a group of illegals from the US to Canada. The compound where Royal Canadian Mounted Police (RCMP) officers process illegal immigrants is not on the map. Nevertheless, the facility is not some mirage in the fields of Quebec — it's quite real. Faith says that just a couple of years ago, it looked like a big tent, and now it's a solid structure with officers on duty around the clock, with modern communications equipment and several police cruisers parked nearby. To their credit, the officers were polite and patient. They seemed a bit surprised to see a Russian journalist at the border, so they checked my press card. Other than that, we're allowed to work as long as we follow their rules. It doesn't take long before a sedan approaches the crossing from the US side. And at this point things get " curiouser and curiouser". A woman with a suitcase exits the taxi and walks towards the building. She says loudly that she's from Tanzania and that she wants to claim refugee status in Canada. RCMP agents tell her to stop because Roxham Road is not a legal port of entry, that she's violating the law and that she will be arrested. The woman refuses to comply and is taken inside the compound. Over the course of just a few hours in the morning, we witnessed the arrival of an elderly lady from India walking with a cane and crying for help, followed by a quiet Brazilian family with kids, and a large Turkish family — thirteen people in total. Illegal border crossing incidents occur in many countries. But during the past couple of years, Canadian authorities have become known for just registering and releasing the offenders. Ever since Canada's Prime Minister Justin Trudeau "welcomed the world" to claim refugee status in Canada with his tweet in 2017, an "illegal port of entry" in Quebec has been turned into a "well-equipped illegal port of entry". 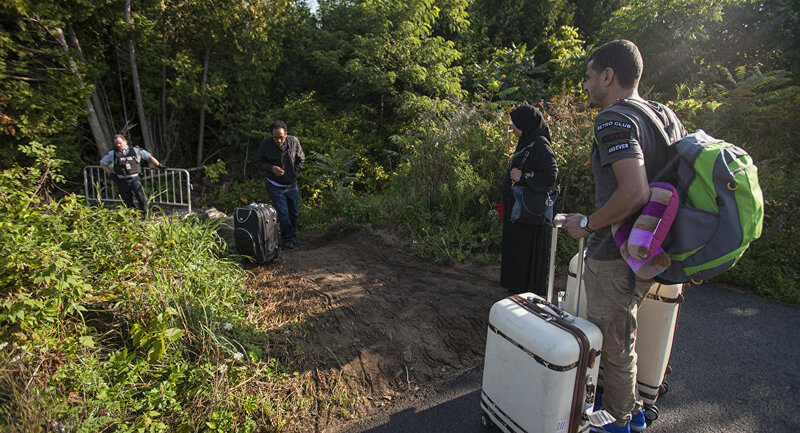 From Roxham Road these people are usually taken to much cosier locations — among them are the downtown YMCA facility in Montreal and Radisson East hotel in Toronto, where they await decisions on their status, which in a majority of cases is positive: they may stay in Canada. No detention or any punitive action: almost everyone whose first steps on Canadian soil start with an illegal act receives free food, shelter, and money. The YMCA building in downtown Montreal is packed with newcomers. The residents — among them families from dozens of countries, including Mexico, Pakistan, Chad, and the Democratic Republic of Congo, get free meals in the cafeteria and even receive instructions on how to deal with immigration paperwork, including filing complaints and reacting to the rejection of their claims. According to Faith Goldy, not many Canadians get a glimpse of what's going on in such centres, since they are closed to outsiders, let alone the media. But once they see what's going on — they often discover that they are being lied to. "The Y" is not the only accommodation option for the newcomers. Those who choose to live in Ontario (yes, they actually get to choose their place of residence), can count on even more freebies. Refugees who didn't get a room in Centennial College's dormitories during the summer months of 2018 were housed at the Radisson Toronto East — all at the expense of Canadian taxpayers. Radisson staff didn't want to go on record about their residents, sending us to the local refugee assistance organisation Costi (Costi has not replied to Sputnik's request for comment at the time of publication), but admitted that the hotel still houses a certain number of refugees. And, judging by the fact that it's impossible to book a room there in the coming weeks, it looks like they are not planning to move out anytime soon. "Yeah, we have some, but do you see any problem? Anything? I don't". Nevertheless, some Radisson customers don't share this optimistic view. Even though the majority of negative comments have recently disappeared from the hotel's TripAdvisor page, some are still there — written by Canadians and foreigners who disliked their recent stay. Bad reviews of hotels housing refugees on TripAdvisor look like the tip of the iceberg: it seems that some Canadians are waking up to the increasing number of problems caused by the "open border policy". Even though they are not used to complaining a lot, most people in the Great White North come from families who have spent years and sometimes decades working hard to be accepted by Canadian society. So, seeing someone enter the country through a hole in the border and be rewarded with a "lucky ticket", paid for by the taxpayer, doesn't seem right to them. "Let's be clear: a criminal, by definition, is someone who breaks the law," says Faith Goldy. "Their first act upon entering our nation is to break our law, and yet, they are treated — some would argue, in a way that most Canadians would desire to be treated". Although it seems that there’s no empirical evidence that the influx of refugee claimants directly affects the growing crime rate in Canada, asylum claims reached their highest level in 2017, while the crime rate increased for the third consecutive year, according to the government agency Statistics Canada. After Trudeau posted a refugee-friendly tweet in January 2017, some 20,000 migrants walked across the border from the US that year, with the total number of asylum claims reaching 49,775. 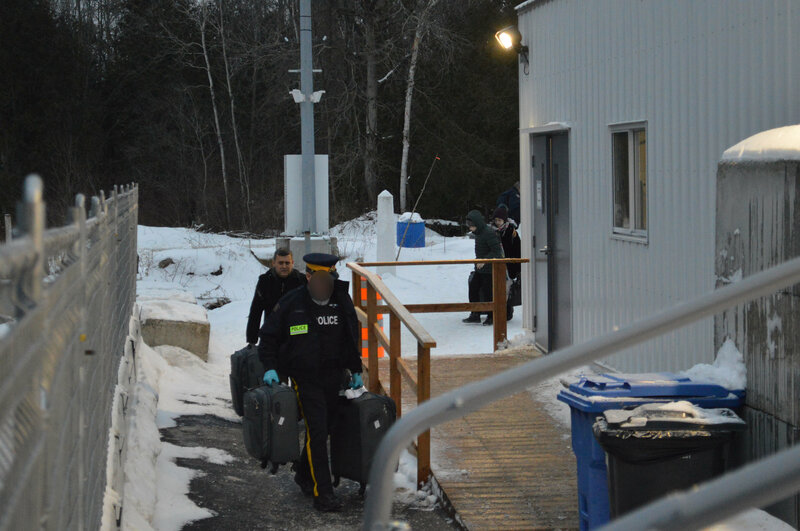 Illegally crossing has become much easier: the Customs and Immigration Union representing CBSA officers stated that a tangible lack of resources had made the country’s border vulnerable, since there are simply not enough people to patrol it. “We got about 117 land border ports and everything in between is wide open so we’re vulnerable right now”, Jean-Pierre Fortin, president of the union, told Global News in 2017. With the October federal election approaching, it's likely that the "migrant card" will be played by both conservative and liberal candidates. But whether the voters will choose to leave things as they are and pick liberal politicians with their "open borders" ideology, or trust the conservatives who want to put Canada first and won’t support throwing tax dollars into the border "rabbit hole" remains to be seen.